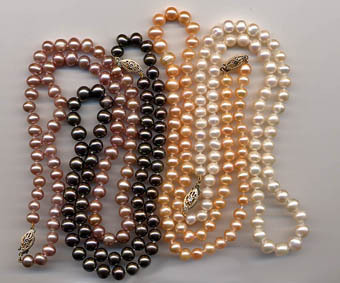 The classic style pearl necklace, individually knotted between pearls with a 14k gold or Sterling Silver oval filigree safety clasp, is made with the classic size 6-7mm freshwater cultured pearls. 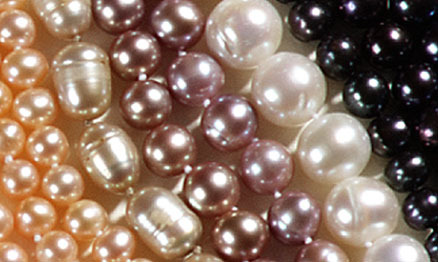 The 6-7mm freshwater pearl necklace is available in 16" and 18" lengths and in white or black pearls. The 18" necklace with 14k gold clasp (pictured at left) is $130, and the 18" necklace with Sterling Silver clasp is $90. See dropdown list of lengths below for prices on other lengths. The necklace comes to you attractively packaged in a colorful silky Chinese pouch for safe storage.